In household and DIY projects, there are many stages when you require adhesives to fix and glue things. These adhesives are used to give strong bond to the concrete and other surfaces and allow them to stay fixed for the longest possible time. From all the different types of adhesives, there are some that provide better support than the others. For instant, Masonry is known to provide better bonding than others. It can be used through a glue gun. Identically, there are different types of concrete adhesive. Their strength can be determined from the ingredients that it is made from. Other than the adhesives, there are professionals in the industry that prefer using liquid nails that is also a kind of bonding adhesive. The only difference is that it comes in a tube. From the different kind of adhesives available in the market, there are few that are ideally known for concrete bonding. Our article today is all about those adhesives and how they can be used. These products are purported to dry instantly and resist climatic changes, water, heat, and oil. If you are looking for the genuine options in the niche then keep reading below and find the appropriate products of your need. To begin with, we would like to go from the softest to the harshest and strongest adhesives in the industry. For example, the white craft adhesive is known for the DIY projects. Although, this particular glue does not work very efficiently but it does have some pros in its kitty. This one has low toxicity and very easy to clean up. 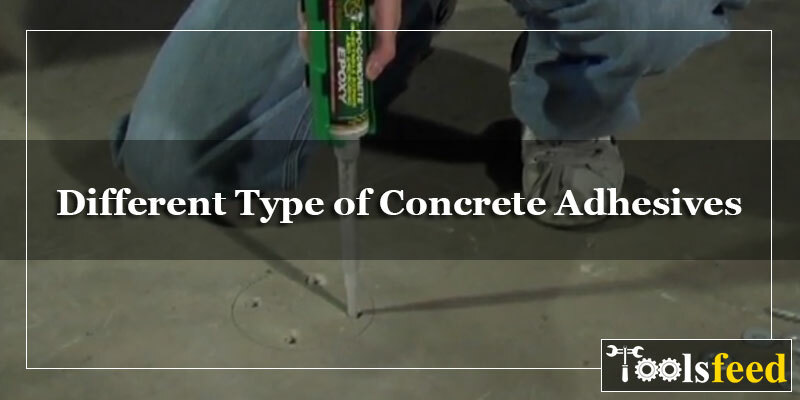 One thing that you need to make sure is that the glue should completely dry after applying so that the concrete does not get displaced. It is water resistant and work for the user for a long time. The set time of the adhesive is 1 hour. Learning about the better choices, we have here the yellow wood glue. It is also made of the same vinyl acetate polymers such as the craft glue. Basically, it gives some extra support to the concrete than the former category explained. It gives better hold to the material. But if you want to use it in the most effective way then best would be to read the label carefully. The set time of this product is 1 hour and it attains the full strength in not more than 24 hours. First is the Type I category which has waterproof properties. The Type II performs best in the exterior conditions. The open time is larger and it can also bond very well in the cold temperature conditions. The Type III is said to be not water-resistant and should be used for interior concrete only. You can use it for whatsoever in-house concrete project requirements that you have. The Cyanoacrylate adhesive is also known as super glue is one of the best products in our list. It bonds quickly and fixes everything efficiently. They form super strong bond and also dry clear. The concrete must fit well to the surface in order to fix well. These products can be purchased in a huge assortment of viscosities that enable some leeway in gap filling performance. The only drawback is that these adhesives can be a little choosy in picking the surface that it works with plus providing the required amount of coverage. With respect to different surfaces, too much or too less can affect the bond. Generally, these glues are not ideal for foamed plastic unless it is a specific kind of bottle plastic or so. These adhesives are best in tensile applications and provide less impact strength requirements. In the uncured state, the acetone solvent wipe can be used for clean-up. Although, once cured, no solvent can dissolve the adhesive afterwards. This adhesive is ideal for different kinds of surfaces and platforms. It is a professional range of adhesive that are used to fix concrete projects and many others. It can be set in different times however, it certainly depends on the surface where the adhesive is used. This one is mostly applied using a glue gun. Basically, it works as per the melting and cooling of the polymers which offers the method of giving and adhesion for the hot melt adhesives. This one comes with high and hot melting options. Plus, it is available in different categories, depending on the polymer type. Also, you can use it on the porous and non-porous surfaces. Considering the fact that it has high viscosity, it fills the gaps effectively and also bond the uneven surfaces efficiently. This type of adhesives is used for strong applications. The drawback is that the adhesives won’t survive changing climatic conditions. But, for various crafts, this adhesive provides instant drying. This is an all-purpose adhesive, suitable for different projects. But it is basically for the DIYers and not for professionals. This kind is available in the form of sheets and dots. It is also an all-purpose adhesive that can be used for multiple projects and in different substances. While it is not as effective as others but you can consider it for a variety of temporary fixing tasks. A spray adhesive is a contact adhesive that is used with the help of a solvent and applied through spray bottle. While applying the adhesive, you should make sure that the room is well ventilated because after the application, it is important to give room to the solvent to evaporate before making the bond. Also, you have to be very careful about the surfacing because once it is mated, you cannot re-position anything. There are specialty contact adhesives as well that you can used to roll or brush. It is used in such a form for the projects that demand more strength. This one is also an all-purpose adhesive that you can used for multiple projects. Epoxy works as a two-part system that is ideal for high-performance bonding. While this is also an all-purpose glue, you can use it for the high-end projects that demand more strength. These are generally very hard and long-lasting adhesives, used to bond to many substrates in intense environmental conditions. These adhesives exhibit an extensive range of clarity and flexibility and cure speed. These also have classic gap filling properties and offer high cohesive strength. You can use this one for concrete projects and justify the task with utmost strength.